Saree is the intrinsic affair of an Indian woman and they know it best how to flaunt it. These are timeless and mysterious and though are to manage by beginners they are just ethereal. This classic traditional Indian ensemble graces every curve of a feminine body so well that women search special occasions and events to wear them. Stylish women stack them in their closet for special events and this is what makes the accessories related to this attire also special. But have you ever think of what has made it so special? Designer blouse patterns and body-shape petticoats can really pitch up your looks. Petticoats are available ready-made and they hide under your drapes and thus any type of work pattern on them doesn’t mean anything to your appeal. So there is a chance for blouse only to complement your designer sarees. But how can you make them extra special? Front patterns are okay and oodles of list are already there in the market for that but what for back designs of blouses? So catch out best and most trending back side design of blouses for all of your stylish sarees and flaunt your best among your peers. This style is the most common type which is almost adorned by everyone. Every woman definitely has at least one or two blouses with a single knot in their closet. In this style, doris from both ends come and the wearer can tie a knot according to her fitting. Now this one is exclusively for designer sarees that are ready to be worn at wedding ceremonies. This style showcases single knot at upper shoulder line and second knot at the back abdomen line. Buy any embellished online saree and adore it with stone embedded or mirror work blouse with double knot style. Let’s draw some attention from the people around! Well, this style is inspired from the 80’s. Bollywood actresses are the first one to grab this style with their Indian ethnic wear. 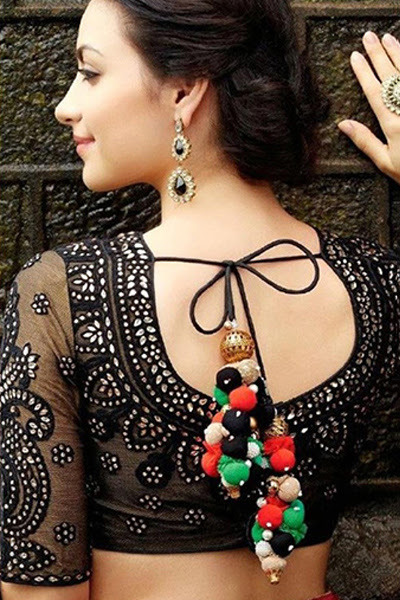 With broad bow style at the back in place of a knot, this style will go awesome with georgette printed sarees. A little bit inspired by rugged crop tops, these stylish blouses have front zippered and back circular loop pattern. Try this style on coral hue or pastel coloured blouses. Net back blouses are the hottest sensation to try with designer sarees. Complement it with contrasting pseudo buttons (fabricated ones) to let your peers can gaze a little more! The classic pieces to remember are cotton sarees and kalamkari sarees which are famous for their simplicity and yet having an X-factor of WOW. In this type of blouse patterns, shirt style buttons are used in place of hooks or zip. Bag some attention from the sides with embroidered online sarees and back buttoned blouses. So whats your favourite blouse style?